Scientists at the University of Missouri have made an incredible prehistoric discovery. A sizable skull fragment, recently uncovered after spending several years hidden away in storage, actually belonged to a gigantic species of ancient crocodile. This finding is unlike anything the researchers have ever seen. The specimen — a hefty hunk of fossilized skull, first discovered years ago in southeastern Morocco — was re-discovered by evolutionary biologist Casey Holliday, who happened upon it while searching through unlabeled specimens in The Royal Ontario Museum. The specimen is thought to come from a previously undescribed species (the researchers have dubbed it Aegisuchus witmeri) dating to the Late Cretaceous period, approximately 95 million years ago. According to the researchers, that makes it the earliest true crocodile specimen ever recovered from Africa. But in terms of uniqueness, this skull fragment has way more going for it than its age; it also features a unique arrangement of bumps and dents, left by blood vessels centered in the roof of A. witmeri's cranium, seen here. These blood vessels, explains Holliday — along with co-author Nick Gardner — in the latest issue of PLoS ONE, were likely necessary for delivering blood to a thick, circular, shield-like mound of skin atop the creature's skull — a physiological feature never before seen in a crocodile. This fleshy anatomical feature has earned A. witmeri the nickname of "Shieldcroc" — a misleading name, perhaps, given that Holliday suspects the croc used its fleshy headgear not for physical protection, but as a visual display for attracting mates or warding off predators. Granted, Shieldcroc would have looked pretty intimidating even without its shield. Analyses of the skull fragment suggest that this prehistoric creature was positively massive. By comparing the skull fragment to those of numerous other species, Holliday and Gardner were able to estimate that the creature's head was somewhere in the range of 2.08—2.86 meters long. A head that size would put the reptile's total length at somewhere between 15 and 22 meters. As a point of reference, your typical city bus is about 10 or 11 meters long. Granted, size estimates based on analyses of skull physiology are prone to significant error — a fact Gardner and Holliday readily admit. 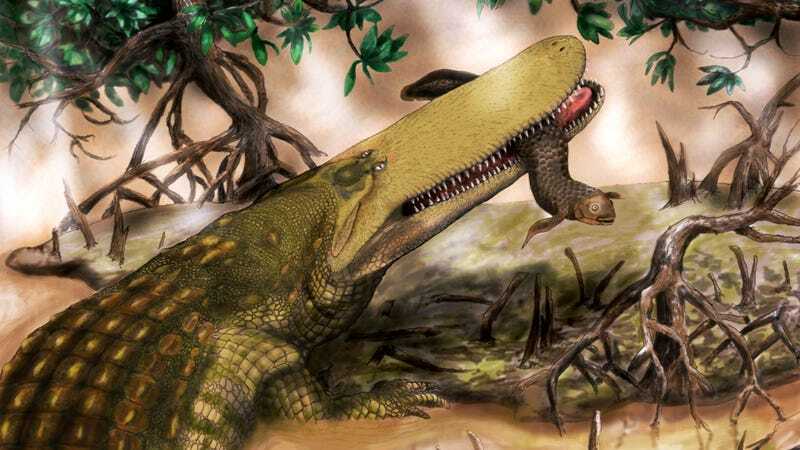 But even if the crocodile was only 9 meters long — which is the length reported in the study's press release — it would still make Shieldcroc 9 feet longer than Earth's largest living crocodile, and raise important questions about relationships between head length and body length in other crocodilian species — including ones we haven't discovered yet. So with all these new fossils we're finding, they're showing us that crocodiles evolved an astounding diversity of cranial form and even function that suggests to a lot of us that the Mesozoic wasn't really an age of dinosaurs like we'd really like to think it was, but in fact it was the age of crocodiles. All images and video, including top image by Henry Tsai, via University of Missouri.